Series 3 consists of the classic Predator 1 Predator (not the Predators variant), Greyback (Predator 2 elder) and the Predator Hounds. 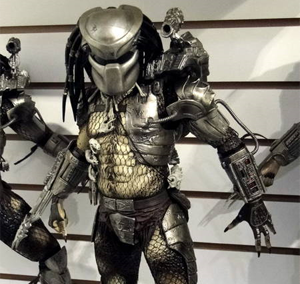 They will also be releasing a Predator 2 series in Fall 2011 which according to NECA may include City Hunter, Boar and Shaman. Other releases will include the Lost Predators from the end of the movie. For more pictures check out the Figures.com gallery. Who are the Greyback, Boar, and Shamen Predators? Those are the 3 that do the breakdown in the Pradator 2 Breakdance video. I think Boar in the last to dance. List of the Predator 2 Predators. Greyback is the elder from p2. It's time for us to live. I hope these are in my price range. I would love some good Alien and Predator figs at long last. These picks aren't really new. but who is the "shaman"? whelp. i guess i won't be buying anything for a while. So for me that will be around $20-30. I mostly gravitate towards 1 6th scale, but if these are that price they are probably smaller. "And it ain't no man..."
Nuts. I need some good 12 inch figures. Either that or some busts from Phillip. Wonder how he does a Pred. Will they do all of them or just boar and shaman? They're doing all of them. Gort Predator is gonna be an SDCC exclusive apparently. Gort with a predator 1 body and bloody skull is. The Gort they'll release will be like in the movie with the Predator 2 body.